This was not so much an expression as it was a response to the “I’m booorrred” cries from my brother, sister, or me when we’d be driving somewhere or if, God forbid, there was no formal activity scheduled for a stretch of hours when Rocky III was not playing on HBO. The idea was that we should be resourceful enough to entertain ourselves at all times. You can only imagine how annoying this phrase was to a 10- year-old who had an entire shelf of lock-and-key diaries, the contents of which proved she was anything but boring. But apparently, the line was not annoying enough to have stopped me from using it at least once a week in my own house with my own kids 25 years later. Not only do I love this expression — I have embraced it as my worldview. I probably don’t have to explain this one, but to put it in terms any parent can understand it means: If your kid comes in first place in the Third Grade Challenge Run, you should feel no need to reward her with an ice cream sundae or an iTouch. The accomplishment itself is the reward. Feeling pride in that accomplishment is what builds self-esteem and motivates a kid. No material acknowledgment should be necessary. We’re not so great at embracing this concept. 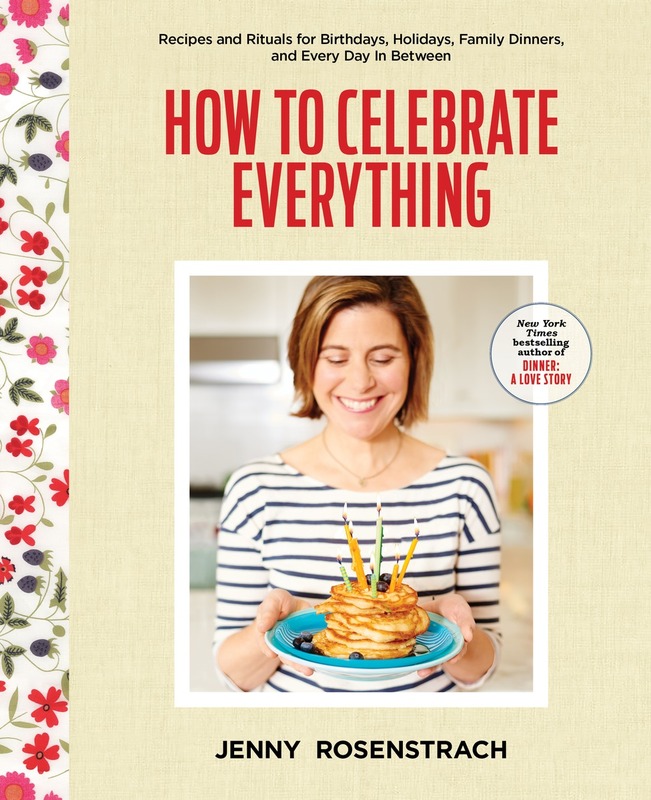 I like to think it’s because of my propensity for celebration (and not my weakness for indulging) that I enjoy marking moments and accomplishments with rewards — material and otherwise. This is why the girls sometimes get a gift on the first or last day of school. And why I usually end up promising Abby a double scoop of mint chip or a Littlest Pet Shop Mermaid if she is brave getting her shots at the doctor. And it’s also why I’ve started a Summer Book Club that rewards their reading with trips to the soccer shop or the toy store. By toy store, I do not mean FAO Schwartz — I mean the local stationery store that sells the mini composition notebook that Phoebe covets; or eBay, where Abby can always find a piece of dollhouse furniture for under $5 including shipping. It’s scary how well this strategy works. As soon as I drew up two separate summer readings lists (with checklists) and handed them over, Abby was curled up with the dog on the couch reading Amulet (10 points) and Phoebe was asking why the library has to be closed on the Fourth of July. 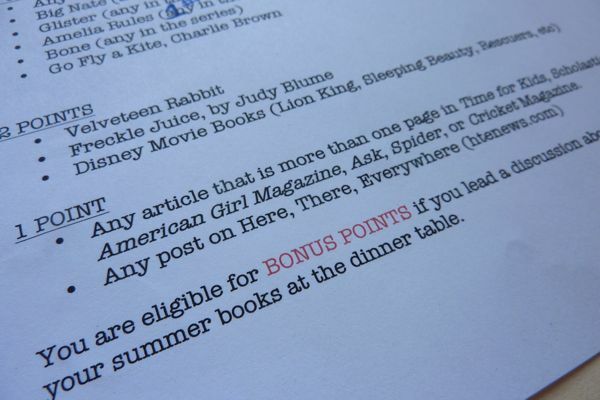 The system is simple: Anything they read — whether it’s a chapter book, a comic book, or even an article in Spider — will earn them a specific number of points, and once they’ve amassed enough points they are eligible to collect prizes. Fifteen points earns them a pack of stickers or a notebook. Thirty is a sleepover in our bedroom even on nights we say No way, not tonight. Eighty is a trip to Playland or the Bronx Zoo. The grand prize — 180 points — is dinner out an a restaurant of their choice. Is this bribery? Definitely. Would my Mom approve? Probably not. But at least no one is pleading boredom. Half the fun: Decorating their folders. I stacked all the summer reading selections we owned in one place so they’d be easily accessible. Day 1: Phoebe has already amassed 20 points and is eligible for a trip to the stationery store. And here’s where she brings it around to dinner! PS: For those of you new to the blog and curious about my daughters’ reading levels, they are ages 9 and 7. I can hear librarians across America swooning with pride with this idea! 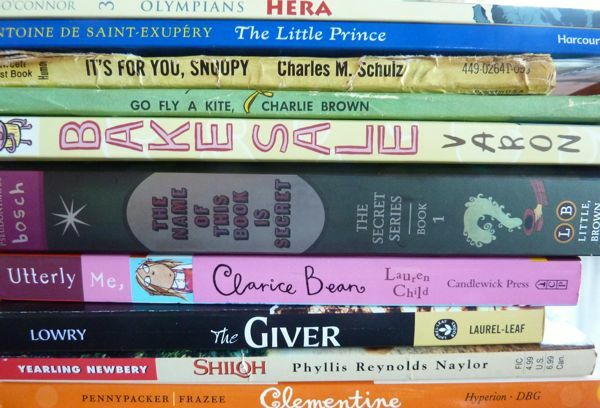 What a fabulous way to get your kids to devour books – Bribery is thy middle name. When my son is old enough to read his own books – we are so close – then I am going to copy this idea. thank you for sharing! this is a great idea! The library summer reading program was incentive … at first — now, as summer is in full swing, I may have to make up my own program! Yea– Such a great idea! I’d love to contribute my middle grade novel to the mix (for 10 points 🙂 Can I send Abby and Phoebe a copy ? Perfect! We have struggled with how to structure summer reading for our twin 6 year olds and 7 year old and I think this is the ticket! Thanks. I really wish my work reading was eligible for some kind of points credit. Maybe a trip to the stationery store would inspire me to work faster/harder??? I’m looking forward to doing this with my kiddos when they are a little older. Jenny, what is that awesome font you used for the reading lists? I love it! Great idea! I’ve had most of the work done for me with our local library’s summer reading program, and the local bank that will deposit $10 into a new or existing account if a child reads 10 books by Labor Day, AND our local AAA baseball team that gives free tickets to kids who meet their reading goals. I’ve had to give each kid a clip board with all their reading lists so they won’t get lost. But I like your addition of specific books. May have to come up with a list of my own. BTW, my 9 year-0ld LOVES The Name of This Book is Secret and its sequels. We’re also currently devouring the Charlie Bone series by Jenny Nimmo. I adore your perspective. Yours in quickly becoming a favorite spot to regularly read. Thank you for putting so much of yourself into your writing. It’s very refreshing and wonderful. Anyone know a way to bookmark something so it shows up in your inbox in 15 years when you’ve finally given in to procreating and have children who are crying “I’m boooooored”? I want to save this idea forever and ever for the future but 27 year old me knows that if I try to mentally bank it, or file it away in my google documents it’ll be long gone before the year is over. Needless to say, FANTASTIC idea! This is too fabulous! Love seeing what those book loving girls of yours are reading!! Has either one of your girls read the ‘My Father’s Dragon’ series?? For my daughter Julia, these books were her version of ‘Twilight’ — she looooooooved these books. I had to read them to her b/c she’s 5, but your girls would be able to tackle them on their own! Although we never got money for getting good grades or things like that, I honestly think my mom would approve of this. Yes! I love this. My sons are not old enough for summer reading yet, but as a middle school English teacher I heartily applaud!! You are doing something wonderful for your girls and for the world they will touch by helping them become lifelong readers. Thank you!! Renee: The font is “American Typewriter!” I use it for everything! Melissa: My Father’s Dragon is a favorite around our house. Glad you brought it up. Perfect for soon-to-be kindergarteners and first graders, don’t you think? We did a variation of this for a couple of summers (maybe I got the idea from Family Fun magazine?). I bought a roll of carnival-like tickets (at our local office supply). The kids got a certain number of tickets for books read, also for time spent practicing their instruments (piano and violin, respectively) and some other “school year responsibilities” that we wanted to challenge them to keep up over the summer. We set up some rewards and ticket requirements (so many tickets for a trip out for ice cream, etc, like your list). The kids really had fun with it, and they actually practiced over the summer instead of letting the music languish. I love this! 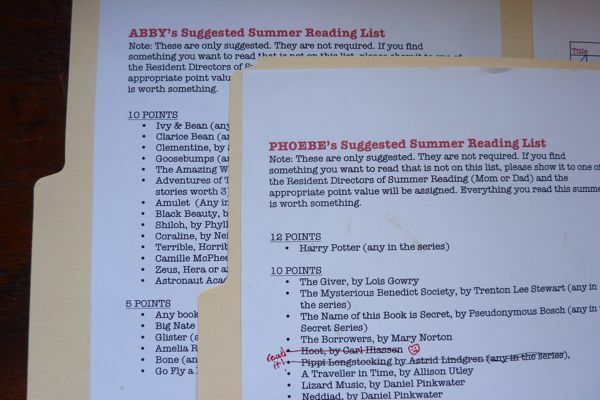 What a fantastic idea, makes me miss summer reading lists and the excitement of ticking each book off. I think I need a grownup version. Genius! Looking forward to my girls reading so I can actually get around to reading my huge backlog of New Yorkers! I recognize that hotel in the background. Block Island? Love it! I also think it is crazy that my dad had the same saying as your mom…. my brother recently found a sign that said, “You’re not bored, you’re boring.” Needless to say, it has a place of honor on the walls of my whole family! 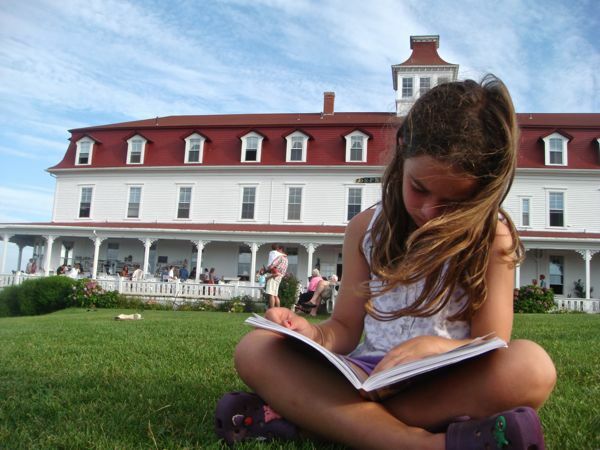 Jacqueline – Yes, it’s the Atlantic Inn on Block Island. Maybe my most favorite place on earth to have a gin and tonic. Sorry: Update, it’s the Spring House, which is right beside the Atlantic. Anyone out there remember Pizza Hut’s summer reading program called “Book It?” Good memories of free personal pan pizzas! This is sucha a fabulous idea! I only wish my kids were a couple of years older so I could do this with them. I would love to see what you have on both kids lists too. I can’t remember your kids ages and grades but I have 2 girls entering 1st and 3rd. One reads a ton but we start to run out of good books that are ok content for her age. The other daughter could use this incentive. Once we’re done with the library program which is great I will do this for the rest of the summer. Thanks! How fabulous is this! We always participate in the summer reading program at our local library, but I never thought of doing this. I don’t think it’s bribing so much as combining reading and their other loves! Everyone needs reading and fun in the summer; otherwise, it wouldn’t be summer. Our summer is halfway over, but we will be doing this next year and because I love summer reading myself, there will be a folder AND rewards for me! Brilliant! I am so glad that my daughter is the same age as your oldest so that I may use all of your ideas NOW. Thank you for doing these things for me!!! It’s hard for us, because our daughter is in year-round school, so only got 2 weeks of summer vacation (one of which was with the grandparents). But, I think this idea could be used for any of her other breaks (or throughout the year) as she already is required to read 30 minutes a day prior to electronics being turned on. I will read up on your book suggestions and probably pass them along to her. Is the photo accompanying this article taken in front of the Spring House on Block Island?? hi! love your blog! i’m curious about the “here, there, everywhere” site that’s on your checklist, but when i go to the address, it’s unregistered. what is this site and is htenews.com the right URL? thanks! I love this idea. 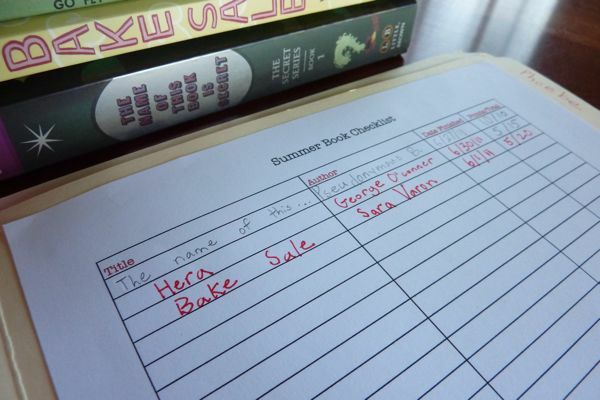 One question: *Where* did you find Bake Sale by Sara Varon? Amazon lists the release date as August 30th…. You must have some pretty sweet connections. the giver = favorite book. well worth ten points. hope someone picks it up soon! I was scrolling down to comment on The Giver as well, and see that I’m not alone in it being one of my favorite books. What a wonderful idea! I love this idea too! I’ve decided to make one for myself whereby I earn points for reading to my son aloud (as I do every day). Just think, I can get a restaurant meal too! my mother was all about “only boring people get bored” I torture my husband with it. Looking ahead to the summer, and remembered this great post! Definitely incorporating it this year; hopefully it will expand the 5 year old’s reading repertoire beyond My Weird School and Babymouse. 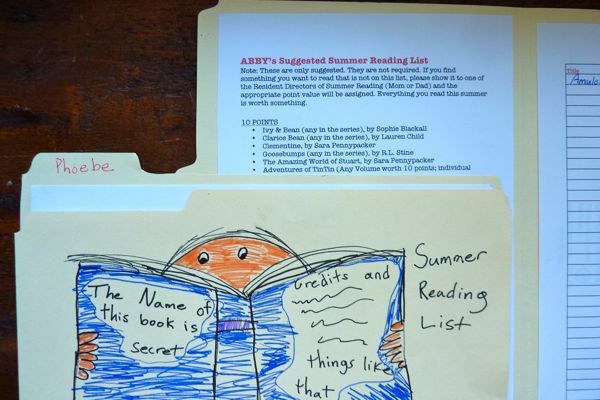 I love this idea for getting kids to read over the summer!! I’ll be saving this do in a couple years when my daughter is beginning to read. summer is coming and i remembered this post from last year – any chance you would pdf your forms and repost them? 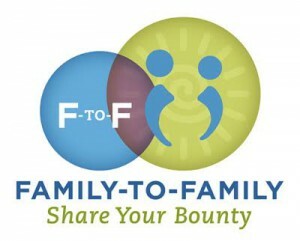 i plan on using this system with my kids this summer and would love a jump start on the forms! Can somebody tell me the name and location of the hotel pictured at the beginning of this blogpost? I love this idea! Would you be willing to share your lists? 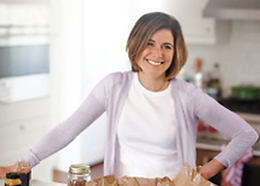 I love your blog & your cookbook! I have turned my sisters on to your recipes as well. I love this reading list idea. I’m seeing it late as we’re already back in school, but think it could work any time of year. I’ve read this post so many times, and I wonder – could you put together something like this for adults?! I have friends and family who love reading but being caught up in busy lives, we tend not to read more than an article here or there. We all agree we could read more. How fun would it be for all of us this year, if we had something like this to do – but with adults? Especially, since it was on everyones New Years Resolution to read more.